Another quick post: the agenda for the Dec 10th board meeting is posted. Looks like a an amazing number of recognitions (Holy Achievements, Batman! ), and an equal load of financial reports that are next to impossible to understand. 🙂 Some other things about School Assignment – of course, I am personally interested in that topic. What is interesting is that it is on the Consent Agenda, even though nobody has talked about it, yet. I have asked several questions (and emailed more questions this morning), but I am not getting much. Provide high quality professional development for both academic and non-academic staff focused on teaching and supporting students of diverse backgrounds. Create safe and competent settings for students to express what they are experiencing in school. Provide opportunities for students to develop and express voice and resistance. Develop and provide elective for credit courses at the high school level that identify and develop venues for students to critically engage issues of social history and race. So these are all good. But here is the problem. Dr. Mark Aber recommended these back in 2000 and again in 2009 (which did not get “published” until 2011). Where are the “safe settings”? I mean, come on! All I see is talk. Where is the walk? 5. secure community understanding and support of the fiscal requirements of a good educational program. Each of those are old. I mean, that does not make less of them, but they are not new by any means. One could copy’n’paste this exact same thing into next year’s 2012-2013 Budget document. And yes, I am picking on this one for a reason. The other objectives have more concrete goals that have been achieved (and accompanying examples). Why am I picking on this one? Well, let me ask, was the community’s understanding and support of the fiscal requirements of a good educational program secured? And is it appropriate that the measure of this goal having been attained are things that the Board and Administration did several years ago? 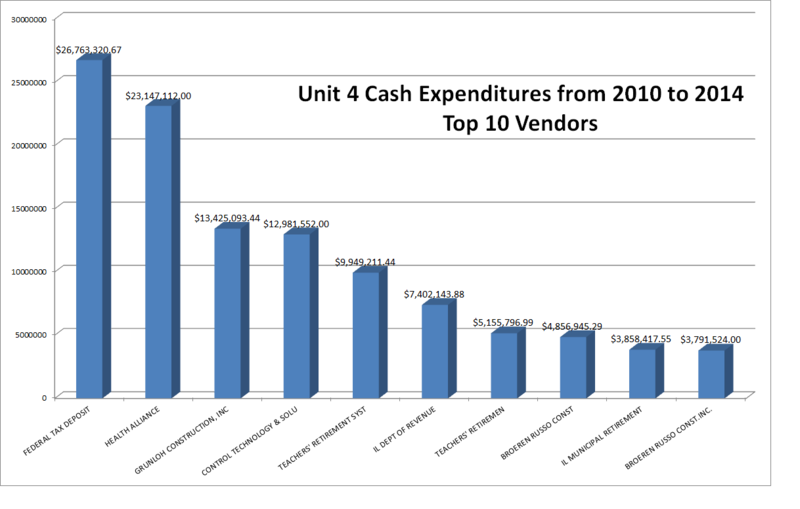 Unit 4 has an image problem, among other issues. Putting the Agendas and all this information online does indeed increase transparency. Due to this increased transparency, we can see some holes. What do you do when you see holes. Hopefully you patch them up. 😉 Putting all this stuff online does not instamagically mean that everyone knows the score. In fact, I only stumbled (in the true sense of web stumbling) upon these items because I was curious. Finding golden nuggets buried in Meeting Minutes and Agendas does not seem optimal. Depending on bloggers, online magazines and news papers to tout your qualities (and/or expose your weaknesses) also does not seem optimal.